Background: One significant cause of mortality and morbidity among populations around the globe is cancer. Many plants have shown their ability for use in developing anti-cancer drugs. Approximately 60% of all anti-cancer drugs, recently in use, are a compound derived from plants.1 Several studies have shown that extracted plants are capable of inducing apoptosis, reducing the lipid peroxides in various cancer cells. Herein, we examined the underlying mechanism of Onosma bracteatum cytotoxicity in prostate cancer (PC3), lung cancer (A549), and breast cancer (BT549). Result: We found that O. bracteatum with multiple concentrations (0.055, 0.11, 0.22, 0.44, 0.88, 1.7 and 3.52 µg/ml) reduced cell viability in a dose- and time-dependent method. The results from lipid peroxides assay indicate that the lipid peroxides (MDA) were decreased in prostate, breast, and lung cancer cells in concentration 1.76µg/ml, compared with the control group. Furthermore, Elisa assay also revealed that caspase-3 activated in prostate, breast, and lung cancer cells in concentration 1.76µg/ml compared to the control (DMSO). Conclusion: O. bracteatum has potential as a drug candidate for the treatment of prostate cancer, lung cancer, and breast cancer. Cancer is an important cause of mortality and morbidity among populations around the globe. The hallmark of cancer is perpetual growth and differentiation of cells without regulation, resulting in the transformation of cells.2 Naturally occurring plant products with potent growth inhibition and apoptosis induction properties have been widely investigated with the aim of developing anti-cancer drugs. Badmus et al.1 reported that 60% of all anti-cancer drugs, currently in use, are plant-derived compounds. A number of these products are widely recognized to possess the potential for inhibiting malignant transformation of cells as well as inducing apoptosis. The natural plant products indicate the presence of potential anti-cancerous bioactive compounds that can be extracted and isolated for further evaluation. The researcher found that there is more than three thousand extracting plant possess critical anticancer properties. The aims of this study were first. Determine the anti-proliferative activity of O. bracteatum on A549 lung cancer cell line, (Figure 1) BT549 Breast cancer cell line, (Figure 2) and PC3 prostate cancer cell line, (Figure 3) Second, investigate the effect of O. bracteatum on Lipid Peroxidase Level in lung cancer (A549), breast cancer (BT549), and prostate cancer (PC3) Cancer cells and evaluate the activation of Caspase-3 by O. bracteatum. 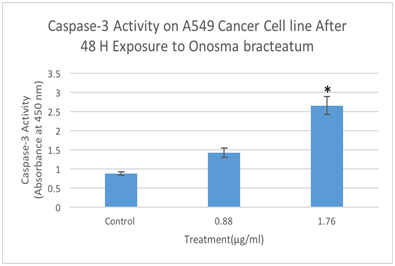 Figure 1 Effect of O. bracteatum on lung cancer (A549) cell lines. As shown above, the extraction of O. bracteatum caused an essential cell viability decrease in A549 lung cancer cells. Dose-response experiments were performed in triplicates with cells treated with O. bracteatum and control (DMSO) in a 96-well plate. Three separate experiments carried out displayed similar results. Control: dimethyl sulfoxide (vehicle) and several concentrations of O. bracteatum (0.055, 0.11, 0.22,0.44, 0, 88, 1.7, and 3.52µg/ml). 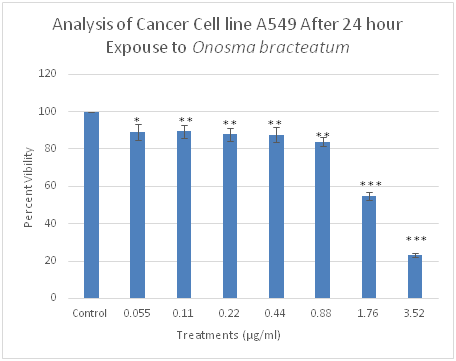 Figure 2 Effect of O. bracteatum on breast cancer (BT549) cell lines. 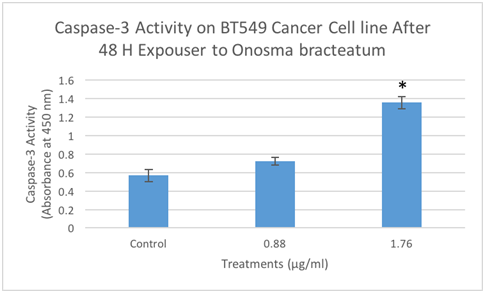 As shown above, the extraction of O. bracteatum caused an essential cell viability decrease in BT549 breast cancer cells. Dose-response experiments were performed in triplicates with cells treated with O. bracteatum and control (DMSO) in a 96-well plate. Three separate experiments carried out displayed similar results. Control: dimethyl sulfoxide (vehicle) and several concentrations of O. bracteatum (0.055, 0.11, 0.22, 0.44, 0,88, 1.7, and 3.52µg/ml). Figure 3 Effect of O. bracteatum on prostate cancer (PC3) cell lines. As shown above, the extraction of O. bracteatum caused essentially to cell viability decrease in PC3 prostate cancer cells. Dose-response experiments were performed in triplicates with cells treated with O. bracteatum and control (DMSO) in a 96-well plate. Three separate experiments carried out displayed similar results. Control: dimethyl sulfoxide (vehicle) and several concentrations of O. bracteatum (0.055, 0.11, 0.22, 0.44, 0,88, 1.7, and 3.52µg/ml). The crude extractions of the organic compounds in O. bracteatum were prepared using a Soxhlet, lyophilizer, and an evaporator. The dried leaves of O. bracteatum were obtained from the place where we got the plant. These samples were placed in a separate, plastic, chemical resistant 15ml centrifuge tube and frozen for twenty-four hours in liquid nitrogen. The samples were then removed and ground separately with a mortar and pistil. The crude extract was then infused in methanol to remove the components distilled for 6hours in a Soxhlet. The methanol was removed with a rotary evaporator. All crude extracts were weighed and dissolved in dimethyl sulfoxide. The extracts were frozen in freeze vials and stored at -20degrees C.
Cell lines representing common kinds of cancer were selected (A549, PC3, and BT549) and were provided by American Type Culture Collection (Rockville, MD). A549 and BT549 were maintained in RPMI-1640, and PC3 in F-12k supplemented with 10% heat-inactivated FBS, 2mM L-glutamine, and 1% penicillin-streptomycin, with the exception. Cells were grown in a 5% CO2 humidified incubator at 370C and passaged biweekly after reaching 80% confluency in 1:2/1:4 ratios for no more than 40 passages. Begin by labeling seven different 2.0ml tubes 0 through 6 for each compound. Then add 1ml of extract to tube 0. Then add 0.5ml of DMSO to tubes 1 through 6. Now make a 1:2 serial dilution from 0(pure extract) to 6(1:16) (Figure 4). 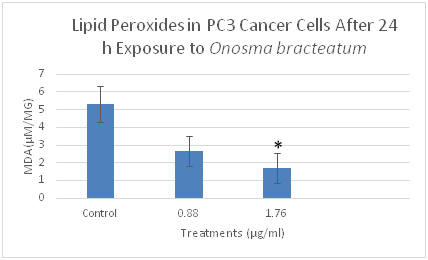 Figure 4 The effects of O. bracteatum extract on the level of lipid peroxides (MDA) in PC3 cells. The cells were treated with different concentrations of the extract (0.88µg/ml and 1.76µg/ml) for 24h, then measured the level of MDA. The level of MDA decreased in the concentration of 1.76µg/ml compared to the control. The result is the means±SEM from three independent experiments. It is significantly different from the unexposed control (DMSO) *p<0.05. Begin by labeling two sets of 7 different 1.5 ml tubes 0 through 6. Obtain one more 1.5ml tube and label it B for the blank. Obtain 1 sample of 15µls from each of the serially diluted tube concentrations and put it in its corresponding 1.5 ml tube. Add 525 µl of media to each 1.5ml tube, followed by 60µl of Alamar Blue in each tube. To make the blank, add 180µl of media and 20µl of Alamar Blue in another 1.5ml tube. Next, obtain a 96 well plate and take 1 sample of 190µl from the blank and put it in well #A1. Then take three different 190µl samples of concentration 0 and put it in Wells F2, G2, and H2. Repeat this step by taking three more different 190µl samples of concentration 1 and putting it in wells F3, G3, H3. Continue this same procedure consecutively for the remaining concentrations. Again, label 7 1.5ml tubes 0 thru 6. Place 15µl of each serially diluted extract into its corresponding labeled tube. Next, add 465µl of media into each tube. Then 60µl of Alamar blue in each tube. Finally, add 60µl of cells (adjusted to 10,000 cells/20µl). Now, take three different samples 190µl samples of concentration 0 and put them in wells A2, B2, and C2. Repeat this step by taking 3 more different 190µl samples of concentration 1 and putting them in wells A3, B3, and C3. Continue this same procedure consecutively for the remaining concentrations. Finally, place the 96 well plates in a CO2 incubator (37ºC) for 24hours and read on a fluorescent spectrophotometer. The cell was plated in six-well plates until they reached 70-100% confluency, and O. bracteatum compound (1.76 and 0.88µg/ml) and DMSO (Vehicle Control) were incubated for 24hours. The plate was rinsed with 1ml of 1x PBS. We added 600µl of trypsin and 600µl of media and centrifuged them, put 110µl of 1x PBS in the pellets and sonicated them using sonicator tool, and added 50µl of the sample in MDA assay 1.5 tubes and 50µl in Bradford assay 1.5 tubes (Figure 5). 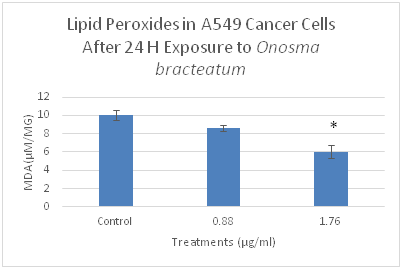 Figure 5 The effects of O. bracteatum extract on the level of lipid peroxides (MDA) in BT549 cells. The cells were treated with different concentrations of the extract (0.88µg/ml and 1.76µg/ml) for 24h, and then measured the level of MDA. The level of MDA decreased in the concentration of 1.76µg/ml compared to the control. The result is the means±SEM from three independent experiments. It is significantly different from the unexposed control (DMSO) *p<0.03. We added R1(kit purchased MD Biosciencesinc) 163µl in each tube of the samples, HCl 37.5µl in one sample tube, added the sample tube in water path 50°C for 1 hour, and added 200µl of the samples in 96 well plate and measured in the Microplate Reader(Filter Max). The absorbance was read in wavelength 586nm. We added 250µl of Coomassie Plus (Bradford) Assay Reagent to the sample tube, incubated for a half hour in 37°C, added 220µl in 96 well plates, and measured in the microplate reader (FilterMax). Lastly, the absorbance was read in wavelength 620nm. The cell was plated in six-well plates until they reached 70-100% confluency, O. bracteatum compound (1.76, 0.88, and 0.44µg/ml) and DMSO (Vehicle Control) were added, and it was incubated for 48hours (Figure 6). The plate was rinsed with 1ml of 1x PBS, 600µl of trypsin was added, media was added, and they were centrifuged and lysed 60µl with Cell lytic M Cell lysis reagent (Sigma-Aldrich, St Louis, MO, USA). We added 20µl triplication of laying cells in 96 well plate, added 180µl of 5% BSA ( Blocking agent ), incubated the plate overnight in 4°C , washed the plate with 300µl of 1x washing buffer , added 100µl of dilution caspase-3 rabbit primary antibody (cell signal company), and incubated the plate for 24 hours in 4°C. We washed the plate with 300µl of 1x washing buffer. We then added 100µl of dilution anti-rabbit HRP- linked antibody (Secondary antibody, cell signal company) in the samples, incubated them for 1hour in 37°C, washed the plate twice with 300µl of the 1x washing buffer. We mixed and added substrate Reagent A and B and added with 100µl in the samples and incubated half hour in 37°C, stop solution was added with 50µl, and the samples measured in the absorbance was read in a microplate reader (Filter Max) at wavelength 450nm. Figure 6 The effects of O. bracteatum extract on the level of lipid peroxides (MDA) in A549 cells. The cells were treated with different concentrations of the extract (0.88µg/ml and 1.76µg/ml) for 24h, and then measured the level of MDA. The level of MDA decreased in the concentration of 1.76µg/ml compared to the control. The result is the means±SEM from three independent experiments. It is significantly different from the unexposed control (DMSO) *p<0.01. We determined the cytotoxicity of O. bracteatum on cancer cells, three cell lines- PC3 (Prostate), A549 (lung), and MCF-7 (breast) were tested, and cell viability was assessed using cell viability assay. Cancer cells were incubated with several concentrations of O. bracteatum (0.055, 0.11, 0.22, 0.44, 0.88, 1.7, and 3.52µg/ml) to study its effects on cell viability using dose-response experiments. Dose-response experiments showed that O. bracteatum was sensitive to A549 lung cancer cells, BT549 breast cancer cells, and PC3 prostate cancer cells. 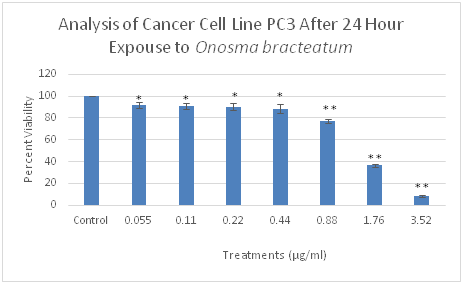 O. bracteatum induced approximately 96% of cell death in a PC3 cancer cell in the highest concentration of O. bracteatum (Figure 3). There were 98, 79, 22% remarkable decreases in the three highest concentrations (3.52, 1.76, and 0.88µg/ml) of O. bracteatum in BT549 cancer cells respectively, as compared to the cell viability of vehicle (DMSO) treated control cells (Figure 7). Subsequently, A549 cells showed that there were 78, 42, 18 % reduced cell viability (Figure 1). Figure 7 Determination caspase-3 activation by Elisa assay designed to detect the activation of caspase-3. A549 cells were treated with different concentration of O. bracteatum (1.76, and 0.88µg/ml) for 48hours and measured the caspase-3 activation. The data represent the mean±SEM of three separate experiments. As shown above, in concentration 1.76 has significant difference compared with the control (DMSO) (p<0.001). Malondialdehyde (MDA) is the popular marker of lipid peroxidation and used to detect the oxidative change. MDA is the end product of lipid peroxidation and is reportedly being higher in the cancer cell. We evaluated whether O. bracteatum would affect the cell's ability to assemble lipid peroxidase as measured by the production of malondialdehyde (MDA) within the cells, and cells were treated with O. bracteatum (0.88µg/ml and 1.76µg/ml) for 24hours. The cell was lysate for the measurement of MDA production as described in the Materials and Methods section. As shown in Figure 5–7, treatments of this PC3, A549, and BT549 cells with different concentrations of O. bracteatum for 24h caused a significant decrease in MDA levels in concentration 1.76µg/ml, compared with the control group. However, in concentration 0.88µg/ml had no significant effect on the levels of MDA, compared with the cells treated with control (DMSO) (Figure 8). Figure 8 Determination caspase-3 activation by Elisa assay designed to detect the activation of caspase-3. PC3 cells were treated with different concentration of O. bracteatum (1.76, and 0.88µg/ml) for 48hours and measured the caspase-3 activation. The data represent the mean±SEM of three separate experiments. As shown above, in concentration 1.76 has significant difference compared with the control (DMSO) (p<0.0001). We investigated whether caspase-3 activated during O. bracteatum exposure, and it was evaluated by Elisa assay using anti-caspase-3. PC3, A549, and BT549 cells were exposed to O. bracteatum, and the result was that the treatment of the cells with O. bracteatum showed a significant increase in caspase-3 activity compared with DMSO treatment (control) (Figure 9). However, no significant increase in caspase-3 activity was observed in concentration (0.88µg/ml). A 48-hour exposure to 1.76µg/ml O. bracteatum increased the activity of caspase-3 in the three types (PC3, A549, and BT549) of cancer cells. These results suggest that the growth inhibitory effect of O. bracteatum in the A549, BT549, and PC3 cells was due to apoptotic cell death. Figure 9 Determination caspase-3 activation by Elisa assay designed to detect the activation of caspase-3. BT549 cells were treated with different concentration of O. bracteatum (1.76, and 0.88µg/ml) for 48 hours and measured the caspase-3 activation. The data represent the mean±SEM of three separate experiments. As shown above, in concentration 1.76 has significant difference compared with the control (DMSO) (p<0.001). Cancer may be a vital reason for mortality and morbidity among populations around the globe. Natural products such as plants, fungi, bacteria, and other organisms in place of modern therapies are used, and much of the attention has been used against this issue. However, Aung et al.3 demonstrated that consolidated utilization of specific phytochemicals with the medications could support the cytotoxicity to cancer cells while downregulating obstruction. The natural plant has been widely examined with a target of developing anti-cancer drugs. Badmus et al.1 reported that 60% of all anti-cancer agents, currently in use, are the plant-derived various types of compounds. However, there is a study on the effect of O. bracteatum in the anti-allergic and anti-inflammatory investigated by Kalpana et al.4 using dried extracts since it is traditionally prescribed as an anti-asthmatic agent in the Indian medical system of Ayurveda. Badmus JA, Ekpo OE, Hussein AA, et al. Antiproliferative and Apoptosis Induction Potential of the Methanolic Leaf Extract of Holarrhena floribunda (G. Don). Evid Based Complement Alternat Med. 2015;2015:756482. Fouad YA, Aanei C. Revisiting the Hallmarks of Cancer. Am J Cancer Res. 2017;7(5):1016–1036. Aung TN, Qu Z, Kortschak RD, et al. Understanding the Effectiveness of Natural Compound Mixtures in Cancer through Their Molecular Mode of Action. Int J Mol Sci. 2017;18(3):656. Kalpana G Patel. Evaluation of The Effect of O. bracteatum Wall (Boraginaceae) on Bronchial Hyperreactivity in Sensitized Guinea Pigs. 2008;7(1):35. Amara S, Lopez K, Banan B, et al. Synergistic effect of pro-inflammatory TNFa and IL-17 in periostin mediated collagen deposition: Potential role in liver fibrosis. Mol Immunol. 2015;64(1):26–35. Platt D, Amara S, Mehta T, et al. Violacein inhibits matrix metalloproteinase mediated CXCR4 expression: Potential anti-tumor effect in cancer invasion and metastasis. Biochem Biophys Res Commun. 2014;455(1-2):107–112. Mehta T, Vercruysse K, Johnson T, et al. Violacein induces p44/42 mitogen-activated protein kinase-mediated solid tumor cell death and inhibits tumor cell migration. Mol Med Rep. 2015;12(1):1443–1448. Agbaje OC, Fadeyi OO, Fadeyi SA, et al. Synthesis and in Vitro Cytotoxicity evaluation of some fluorinated hexahydropyrimidine derivative. Bioorg Med Chem Lett. 2011;21(3):989–992. Paul A, Das S, Das J, et al. Diarylheptanoid-myricanone isolated from ethanolic extract of Myrica cerifera shows anticancer effects on HeLa and PC3 cell lines: signalling pathway and drug-DNA interaction. J Integr Med. 2013;11(6):405–415. Fadeyi SA1, Fadeyi OO, Adejumo AA, et al. In vitro anticancer screening of 24 locally used Nigerian medicinal plants. BMC Complement Altern Med. 2013;13:79. Steffani N Driggins, Margaret Whalen, Elbert Lewis Myles. The Inhibitory Effect of Echinacea purpurea and Echinacea pallida on BT-549 and Natural Killer Cells. MOJ Cell Sci Rep. 2017;4(3):88‒96. © 2018 Albaqami et al. This is an open access article distributed under the terms of the Creative Commons Attribution License , which permits unrestricted use, distribution, and build upon your work non-commercially.